This page was enrolled in the Residents and Fellows contest. Assigned status Up to Date by Cat Nguyen Burkat, MD FACS on January 2, 2019. A contracted socket is a complication of an anophthalmic socket which results in the inability to support a prosthesis. It is an uncommon but significant problem for the ophthalmic plastic surgeon. 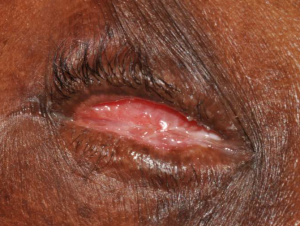 A poorly fitting prosthesis results in subpar cosmesis, can be damaging to the psyches of patients, and can result in additional injury and infection. A contracted socket can occur weeks to years after enucleation or evisceration. While historically it was believed that the symblepharon and sulcus deformity associated with a contacted socket were incurable, advances in the use of grafting materials, alloplastic implants, and flaps have allowed contracted sockets to be reformed, therefore returning the function of the normal fornix. The contracted socket should not be confused with Post Enucleation Socket Syndrome (PESS) which is characterized by a deep upper eyelid sulcus, lower lid laxity, and eyelid malpositions without shrinkage or shortening of the soft tissues. 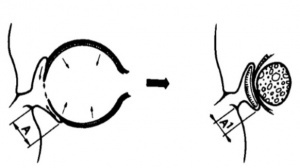 Figure depicting changes in orbital volume and forniceal depth as a result of evisceration. Published in 1974 by Lars Vistnes MD and Ronald Iverson MD in Plastic and Reconstructive Surgery. As described by Vistnes and Iverson in 1974, enucleation and evisceration result in a large defect and volume deficit. An enucleation involves removing the entire globe via separating recti muscle attachments and the optic nerve at its insertion. An evisceration removes the ocular contents through a space that was previously the cornea. An implant which is then placed is smaller than the native globe to allow for the recti muscles, Tenon's capsule, and conjunctiva to be closed above it. This closure decreases the volume of the orbit and shallows the upper and lower sulci. Additionally, the ocular adnexal tissues tend to contract in response to concomitant infection, inflammation, or trauma which can further limit the amount of extra space for an ocular prosthesis to fit. Frequently, a prosthetic can resist the excessive contraction forces by the injured socket, but there are instances when scarring extrudes the prosthesis regardless of how well it initially fits. These contractile forces act from a posterior to anterior direction. A tarsorrhaphy and an alloplastic plate fixed to the orbital rim can be used to counteract these forces but is occasionally ineffective. 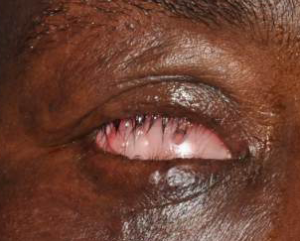 It has been reported that the eyelids can retract over the orbital rim and/or fixated plate with pressures high enough to cause necrosis. There have been many attempts to classify contracted sockets but no system has fully been adopted. Grade 0 Socket is lined with healthy conjunctiva and has deep and well formed fornices. Grade 1 Shallow lower fornix or shelving of the lower fornix. Grade 2 Loss of the upper and lower fornices. Grade 3 Loss of the upper, lower, medial, and lateral fornices. Grade 4 Loss of all the fornices and reduction of palpebral aperture in horizontal and vertical dimensions. Grade 5 Recurrence of contraction of the socket after repeated trials of reconstruction. Class I These are the patients that only have insufficient lining of the eye socket, no enophthalmos, no soft tissue or bony deficiency of the orbit or periorbital area. Class II These patients have insufficient eye socket lining as well as deficiency in the soft tissue of the orbital content, so that even after the eye socket is successfully reconstructed the prosthetic eye will look enophthalmic. Class III These patients not only have deficiencies of the eye socket and orbital soft tissue, but are also deficient in growth of the periorbital tissues and bones. Grade 1 Minimal or no actual contraction. Patients usually complain of inability to retain the prosthesis for a long time. Horizontal lid laxity is usually observed in these patients, with subsequent prolapse or retraction of the inferior fornix. Patients with an unusually large or anteriorly displaced implant also fall in this category. Grade 2 Mild contracture of the inferior and/or the superior fornix. Patient either complains of inability to wear the prosthesis or may complain of a cosmetic disfigurement due to rolling-in of the upper and lower eyelid margin. Grade 3 More advanced scarring than grade 2. Cicatrization generally involving the entire upper and lower fornices. Wearing the prosthesis is impossible. Grade 4 Severe phimosis of the palpebral fissure both vertically and horizontally. Recurrent cases and irradiated sockets are also included in this category. 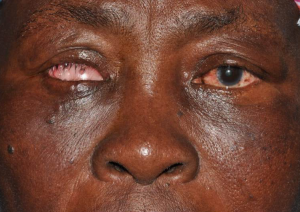 This is a 57-year-old female who sustained trauma to her right eye at the age of 6 in Ghana. This resulted in enucleation and no orbital implant was placed. Multiple reconstructions were unable to expand her socket to allow for retention of a prosthesis. She presented with a severely contracted right socket with volume loss. Photo courtesy of Gerald Harris MD. The goal of management is to reform the scarred fornix vertically and posteriorly to approximate the form and function of the normal fornix. This involves excision of all symblepharon followed by the placement of a graft or flap that promotes re-epithelization and increased conjunctival surface area. Since the presentation of a contracted socket can be extremely variable, management is always tailored to the specific needs of the patient. Management of the contracted socket is based on two important clinical findings. The first, severity and location of symblepharon, and the second, amount of residual orbital volume. Right contracted socket status post (staged) dermis fat graft, buccal mucosal membrane graft and nylamid rim fixated sutured conformer. The lid crease is now present and there is added volume in the superior sulcus. Photo courtesy of Gerald Harris MD. Close up of post operative contracted socket with nylamid rim fixated sutured conformer. Photo courtesy of Gerald Harris MD. When there is minimal symblepharon, a z-plasty (which can lengthen a contracted scar or rotate the scar tension line) or local conjunctival flap can be sufficient to provide room for a prosthesis to fit. Lower lid laxity is managed with horizontal tightening procedures. If there is prolapse of the forniceal conjunctiva due to anterior migration of the inferior intraorbital fat causing an inadequate inferior cul-de-sac, this can be managed via externalized sutures or conjunctival fixation to the inferior orbital rim periosteum. If the inferior fornix is primarily scarred and the posterior lamella requires lengthening, various grafts including nasal septum, auricular cartilage, sclera , hard palate, or fascia lata can be implanted. On the other hand, the Weis procedure can be used if there is cicatricial entropion in the setting of normal forniceal depth. Historically, when there is moderate symblepharon or when there is limited conjunctiva, split thickness mucosal or full thickness conjunctival autografts are necessary. Because mucosal grafts can undergo extensive contraction and result in foul smelling discharge, other materials are now advocated. Amniotic membrane grafts (AMG) have garnered immense support as they allow for conjunctival epithelial migration. One study showed there was statistically significant increase in fornix depth and volume measurements with AMG at 12 months. They are not associated with mucous discharge, have decreased morbidity, and improved recovery time. However, because amniotic membranes grafts are substrate grafts, they cannot be used when contraction is severe as there are no residual conjunctival epithelial cells to differentiate and migrate. When used, AMGs should be applied via quilting sutures which provides improved apposition to the recipient bed. Other reasons to why a surgeon might choose an AMG over another type of autograft is the limited amount of available autograft material, need for a second surgical donor site which increases morbidity and increased operating room time. The use of a dermis fat graft (DFG) can be appropriate when the contracted socket has associated volume loss. The usage of DFG was first popularized by Byron Smith in the late 1970s as a way to supplement volume at the time of enucleation and to preserve the fornices and conjunctiva. They are frequently harvested from the abdominal, gluteal and thigh regions. The viability of dermis by itself was substantiated by Wojno and Tenzel. They noted that the dermis is easily accessible and harvested. When the epidermis is properly removed, there is low incidence of cyst formation. The hair follicles and sebaceous glands within the dermis disappear within 1-3 month. Multiple reports have demonstrated viability of DFGs long-term with complications occurring mainly in sockets that have significant vascular compromise to the donor bed and therefore increase the risk of fat atrophy and failure. A recent report describes the use of composite hard palate-dermis fat grafts (HPDFG) to both expand volume and lengthen the posterior lamella. Severely contracted sockets with little to no residual conjunctival lining and those that have failed previous surgeries are extremely difficult to repair. They can potentially be managed with space occupying alloplastic materials (i.e. silicone, polyethylene) or conformers fixed to the orbital rim which push a graft against the posterior orbit recipient bed while counteracting the forces of contraction during scarring. Additionally, rotational or microvascular free flaps from a variety of locations can be used to re-vascularize the damaged conjunctiva, most importantly in post-radiation or repeat surgery patients, but are difficult to perform and frequently require the expertise of other non-ophthalmologic surgical sub-specialties. A few examples of flaps that have had success include retroauricular, superficial temporalis facia, radial skin, thoracodorsal artery perforator, and galea. Detailed flap descriptions can be found in the general plastic surgery literature. Conformers are usually placed at the time of surgery, and as discussed previously, may even be sutured in to ensure separation of the posterior lamella of the eyelid from the conjunctival surface and maintain the newly formed fornicies. The conformer may be left in for extended periods of time to prevent re-contracture of the socket. Unlike many ophthalmological procedures, there is no standard surgical follow-up for contracted socket reconstruction. Each case will be slightly different with post operative care ranging from 6-8 weeks to 1-2 years. As expected, more severely contracted sockets will require more extensive surgery and longer follow-up periods. This is especially the case for rotational and microvascular flaps where a staged approach may be taken. Immediate post-operative care follows the typical oculoplastic time frames of 7-10 days for the first visit and 3-6 weeks for the second visit since surgery. In severely contracted sockets that have undergone extensive reconstruction or patients that have had multiple prior procedures, it is common to leave the conformer in place for months or even up to a year or more. The end point is reached when a prosthesis can be easily fitted and the socket can maintain the prosthesis in place. Dermis fat grafts (DFG) tend to do very well. There can be a marked degree of fat atrophy (up to 50%) which can be difficult to predict in adults. This can be overcome by intentionally placing more fat in the socket at the time of surgery with assumption that a percentage of the volume will be lost. In children, DFGs can grow as the child ages. This is often desirable but can lead to volume asymmetry or a poorly fitting prosthetic if the growth is excessive. If the epidermis is not meticulously removed from the DFG prior to placing it in the orbit, pilosebaceous units can produce hair and oils in the socket. Arguably, the worst complication may be the failure of an axial or microvascular free-flap. Flap surgery when performed is an indicator of the severe nature of the contracted socket and the poor vascular supply to the orbit. Prior attempts to correct the socket have failed and there are few remaining options. The type of flap that is initially chosen usually offers the best chances for procedural success. If a flap fails then this may necessitate choosing another flap that does not offer the same benefits and the need for the patient to undergo another procedure with additional donor site morbidity. There are multiple factors which help determine the overall prognosis of contracted socket reconstruction. First, if there is an underlying condition causing the contraction then this needs to be corrected. Options include behavioral changes to keep a prosthesis in place, controlling conjunctival cicatrizing processes through systemic management (i.e. patients with autoimmune conditions) or treating local infections. Second, the degree of contraction and the number of previously performed reconstructions negatively correlates with expected surgical outcomes. Mild to moderate sockets will likely have good results with AMG or DFGs. Severely contracted sockets, however, may need repeat or even staged procedures over a period of months to years to allow for full re-epithelialization. This includes cases when conformers are sutured/fixated to the orbital rims to maintain the fornices. ↑ Tadros MA. Surgical psycho-ophthalmology and contracted sockets. Adv Ophthalmic Plast Reconstr Surg. 1990;8:274-9. ↑ Wiener M. Restoration of the Conjunctival Culde-Sac for the Insertion of an Artificial Eye. JAMA. 1908;LI(13):1070-1072. ↑ Tyers AG, Collin JR. Orbital implants and post enucleation socket syndrome. Trans Ophthalmol Soc U K. 1982 Apr;102 (Pt 1):90-2. ↑ 4.0 4.1 4.2 4.3 4.4 Vistnes LM, Iverson RE. Surgical Treatment of the Contracted Socket. Plast Reconstr Surg. 1974 May;53(5):563-7. ↑ 5.0 5.1 Dortzbach RK. Socket Reconstruction: What Really Happens. Trans Sect Ophthalmol Am Acad Ophthalmol Otolaryngol. 1976 Jul-Aug;81(4 Pt 1):OP583-6. ↑ Krishna G. Contracted sockets (aetiology and types). Indian J Ophthalmol 1980; 28:117–120. ↑ 7.0 7.1 Guyuron B. The role of flaps in the management of contracted eye sockets. Adv Ophthalmic Plast Reconstr Surg. 1992;9:143-57. ↑ 8.0 8.1 8.2 8.3 Tawfik HA, Raslan AO, Talib N. Surgical management of acquired socket contracture. Curr Opin Ophthalmol. 2009 Sep;20(5):406-11. ↑ 9.0 9.1 9.2 Karesh JW, Putterman AM. Reconstruction of the partially contracted ocular socket or fornix. Arch Ophthalmol. 1988 Apr;106(4):552-6. ↑ Ma'Luf RN. Correction of the inadequate lower fornix in the anophthalmic socket. Br J Ophthalmol. 1999 Jul;83(7):881-2. ↑ Neuhaus RW, Hawes MJ. Inadequate inferior cul-de-sac in the anophthalmic socket. Ophthalmology. 1992 Jan;99(1):153-7. ↑ 13.0 13.1 Wojno T, Tenzel RR. Dermis grafts in socket reconstruction. Ophthalmic Plast Reconstr Surg. 1986;2(1):7-14. ↑ 14.0 14.1 14.2 Kumar S, Sugandhi P, Arora R, Pandey PK. Amniotic membrane transplantation versus mucous membrane grafting in anophthalmic contracted socket. Orbit. 2006 Sep;25(3):195-203. ↑ Smith RJ, Malet T. Auricular cartilage grafting to correct lower conjunctival fornix retraction and eyelid malposition in anophthalmic patients. Ophthalmic Plast Reconstr Surg. 2008 Jan-Feb;24(1):13-8. ↑ Vastine DW, Stewert WB, Schwab IR. Reconstruction of the periocular mucous membrane by autologous conjunctival transplantation. Ophthalmology. 1982 Sep;89(9):1072-81. ↑ 17.0 17.1 17.2 Pooyathalang A, Preechawat P, Pomsathit J, Mahaisaviriya P. Reconstruction of contracted eye socket with amniotic membrane graft. Ophthalmic Plast Reconstr Surg. 2005 Sep;21(5):359-62. ↑ 18.0 18.1 Bajaj MS, Pushker N, Singh KK, Chandra M, Chose S. Evaluation of amniotic membrane grafting in the reconstruction of contracted socket. Ophthalmic Plast Reconstr Surg. 2006 Mar-Apr;22(2):116-20. ↑ Smith B, Petrelli R. Dermis-fat graft as a movable implant within the muscle cone. Am J Ophthalmol. 1978 Jan;85(1):62-6. ↑ Smith B, Bosniak S, Nesi F, Lisman R. Dermis-fat orbital implantation: 118 cases. Ophthalmic Surg. 1983 Nov;14(11):941-3. ↑ 21.0 21.1 Wojno T, Tenzel RR. Dermis Grafts in Socket Reconstruction. Ophthalmic Plast Reconstr Surg. 1986;2(1):7-14. ↑ Starks V. Freitag SK. Postoperative Complications of Dermis-Fat Autografts in the Anophthalmic Socket. Semin Ophthalmol. 2018;33(1):112-115. ↑ Choi CJ, Tran AQ, Tse DT. Hard palate-dermis fat composite graft for reconstruction of contracted anophthalmic socket. Orbit. 2018 Aug 8:1-6. ↑ Bhattacharjee K, Bhattacharjee H, Kuri G, Das JK, Dey D. Comparative analysis of use of porous orbital implant with mucus membrane graft and dermis fat graft as a primary procedure in reconstruction of severely contracted socket. Indian J Ophthalmol. 2014 Feb;62(2):145-53. ↑ Putterman AM1, Karesh JW. A surgical technique for the successful and stable reconstruction of the totally contracted ocular socket. Ophthalmic Surg. 1988 Mar;19(3):193-201. ↑ 26.0 26.1 Foster JA, Castro E, Papay FA. Reconstruction of the irradiated contracted socket with an expanded superficial temporalis fascial flap. Am J Ophthalmol. 1999 May;127(5):621-2. ↑ Guyuron B. Retroauricular island flap for eye socket reconstruction. Plast Reconstr Surg. 1985 Oct;76(4):527-33. ↑ Suh IS, Yang YM, Oh SJ. Conjunctival cul-de-sac reconstruction with radial forearm free flap in anophthalmic orbit syndrome. Plast Reconstr Surg. 2001 Apr 1;107(4):914-9. ↑ Koshima I, Narushima M, Mihara M, Uchida G, Nakagawa M.J. Short pedicle thoracodorsal artery perforator (TAP) adiposal flap for three-dimensional reconstruction of contracted orbital cavity. Plast Reconstr Aesthet Surg. 2008 Dec;61(12):e13-7. ↑ Liu D, Michon J, Choi J. Galeal flap: clinical application in periorbital and orbital reconstruction. Ophthalmic Plast Reconstr Surg. 1996 Dec;12(4):273-8. This page was last modified on March 8, 2019, at 15:27. This page has been accessed 5,782 times.